EXTREMELY FINE. ONE OF ONLY FIVE RECORDED EXAMPLES OF THIS NATIONAL BANK NOTE COMPANY 1861 ISSUE ENVELOPE ESSAY, AND THE ONLY EXAMPLE IN ULTRAMARINE. A review using Power Search reveals the rarity of these National Bank Note Company envelope essays. Search using the term "Undersander" and more than 100 envelopes come up, but nearly all are 1869 Pictorial or 1870 Bank Note Issues. None we have sold come from the 1861 Issue. These 1c envelopes and the 3c envelopes that follow are among the great essay-proof rarities of the 1861 Issue. EXTREMELY FINE. 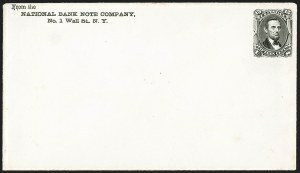 ONE OF ONLY FIVE RECORDED EXAMPLES OF THIS NATIONAL BANK NOTE COMPANY 1861 ISSUE ENVELOPE ESSAY, AND THE ONLY EXAMPLE IN DEEP CARMINE. EXTREMELY FINE. ONE OF ONLY FIVE RECORDED EXAMPLES OF THIS NATIONAL BANK NOTE COMPANY 1861 ISSUE ENVELOPE ESSAY, AND THE ONLY EXAMPLE IN BROWN. EXTREMELY FINE. 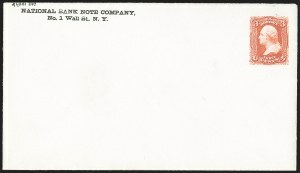 ONE OF ONLY FOUR OR FIVE RECORDED EXAMPLES OF THIS NATIONAL BANK NOTE COMPANY 1861 ISSUE ENVELOPE ESSAY, AND THE ONLY EXAMPLE WITH THE COMPANY IMPRINT. A review using Power Search reveals the rarity of these National Bank Note Company envelope essays. Search using the term "Undersander" and more than 100 envelopes come up, but nearly all are 1869 Pictorial or 1870 Bank Note Issues. None we have sold come from the 1861 Issue. 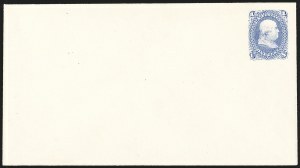 These 3c envelopes and the 1c envelopes that precede these are among the great essay-proof rarities of the 1861 Issue. It is interesting to note that of the seven envelope essays contained in the Drews collection, only this and the unique 15c example have sealed and gummed flaps and the return address imprint. It may be that NBNCo. actually intended to use these from its offices on Wall Street. We would surely like to see one that went through the mails. EXTREMELY FINE. 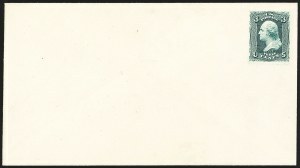 ONE OF ONLY FOUR OR FIVE RECORDED EXAMPLES OF THIS NATIONAL BANK NOTE COMPANY 1861 ISSUE ENVELOPE ESSAY, AND THE ONLY EXAMPLE IN LAKE. EXTREMELY FINE. ONE OF ONLY FOUR OR FIVE RECORDED EXAMPLES OF THIS NATIONAL BANK NOTE COMPANY 1861 ISSUE ENVELOPE ESSAY, AND THE ONLY EXAMPLE IN GREEN. VERY FINE. 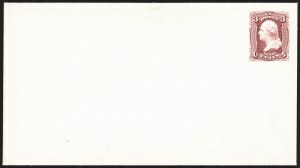 THIS IS THE ONLY RECORDED EXAMPLE OF THE NATIONAL BANK NOTE COMPANY 15-CENT 1866 ISSUE ENVELOPE ESSAY. The Undersander Catalog of United States Stamped Envelope Essays and Proofs notes that an 1860's journal called the Postman's Knock predicted that the USPOD would issue a 15c Lincoln envelope as a companion to the memorial Lincoln stamp (Scott 77). Of course no such envelope was ever issued. 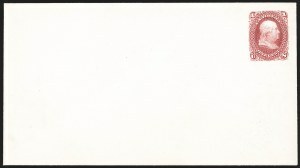 This envelope essay was unknown to early collectors and catalogers, including Thorp, Maisel and Brazer, and therefore was long unlisted. This discovery copy first appeared in a William Weiss auction in 1999. It is interesting to note that of the seven envelope essays contained in the Drews collection, only this unique 15c example and the 3c offered in lot 55 have sealed and gummed flaps and the return address imprint. It may be that NBNCo. actually intended to use these from its offices on Wall Street. We would surely like to see one that went through the mails.